Cyprus is zeroing in on a solution to avoid getting ejected from the EMU. It's simple. Since taxing everyone's account by a few percent didn't work, it's time to raid all the larger accounts. NY Times: - With Cyprus facing a Monday deadline to avoid a banking collapse, the government and its international negotiators devised a plan late Saturday to seize a portion of savers’ deposits above 100,000 euros at all banks in the country, in a bid to raise money for an urgently needed bailout. A one-time levy of 20 percent would be placed on uninsured deposits at one of the nation’s biggest banks, the Bank of Cyprus, to help raise 5.8 billion euros demanded by the lenders to secure a 10 billion euro, or $12.9 billion, lifeline. A separate tax of 4 percent would be assessed on uninsured deposits at all other banks, including the 26 foreign banks that operate in Cyprus. This action will really upset the Russian mafia, but is not going to save the the nation's banks. Once the financial system opens for business, the run on banks will ensue - no matter what sort of controls the authorities will try to impose. No sane depositor who is able to open an account in Germany, France, or even Italy would leave cash in Cyprus. As far as the depositors are concerned, if the Cypriot authorities have done it once, they can do it again. Some of those deposits will quickly move back to where they came from - Russian banks. Given the size of deposits at Cypriot banks, there isn't enough in eligible collateral for MRO financing (short term secured borrowing from ECB) to replace these lost deposits. The flight of capital will increase the funding needs far beyond the €10bn Cyprus is trying to raise. And it's unclear if the ECB should continue to provide further emergency loans (ELA). After all, the Eurosystem's exposure to Cyprus is simply insignificant on a relative basis. The ECB's balance sheet is still massive. It can generate more than enough interest income in a few months to cover the losses of Cypriot banks' defaulting on their ECB loans. So why throw good money after bad? Of course there are geopolitical implications of walking away from Cyprus. 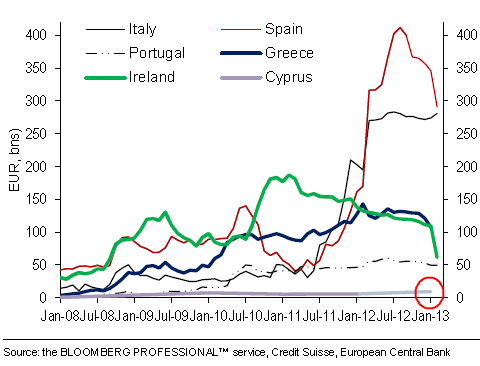 Letting banks fail will likely result in Cyprus exiting the EMU and some fear that will trigger a contagion effect. However if the ECB sticks with its OMT program (commitment to buy unlimited amounts of periphery bonds) for the rest of the periphery, the effect of "Cyprexit" could be contained. But when it comes to the Eurozone, there is rarely a decisive action, and this mess will likely persist for some time.